ADXL345 3-axis Accelerometer AVR Atmega library. a SPI (3- or 4-wire) or I2C digital interface. User can setup measurement mode to 2/4/8/16G. Calibration is suggested to get more accurate paramenters. hi, may i know how do u communicate the sensor with the PC? through uart, you can find an uart library inside the code. on simple way is to connect the tx pin to a tx pin of a ttl to usb device . http://www.processing.org/, you can file sample code in this project download files. hey! i am a newbie. i want to connect ADXL345 to atmega16. how can i do it and get the readings on the lcd. how ADC pins has to be used for the same. thank you. just compile the code you find here for your Atmega16, it should work! ror the pin look at the datasheed of your microcontroller to connect the correct one. for the LCD there are some library you should use, just google for it, i use the peter fleury one. thanks.but if some how i cannot use scl and sda pins of my Atmega16, can i still connect my adxl345 to it? i am sorry but i cannot find any code for adxl345 with atmega16. can u give me the exact link of the code and the pin configuration? thank you. I have used your library for my project using same controller ATmega8. i am using hyper terminal for testing. it working but on terminal i am not receiving proper data. i am getting different symbols. please guide me. and also want to know how to use processing code to see 3D movement. to show data as numeric on you terminal, check that you have properly setup baudrate, also check atmega8 FCPU. than compile using DEBUG_ENABLED set to 1.
for 3d movement, i use precessing, set DEBUG_ENABLED back to 0, and it should work. hi Davide would you please help me to understand Interrupt pin function of ADXL345. i want ADXL345 to give interrupt to my ATmega8 if data is available or axis is changed. i do not understaind what you mean with "axis is changed"
i've never us it, does the DATA_READY interrupt can help you? try debugging with you scope/logic analiz., first check if data_ready makes the adxl345 works, then check if your atmega int is enabled (check this even without the accellerometer). also try with some other arduino library around here, maybe you can find usefull snippet there. i am facing new problem now. i am getting this type of data. what can be the reason for it? can you guess? Hello Devide, I have done some coding and tesing for interrupt request from ADXL345 to ATmega8. i am getting low level interrupt from ADXL to ATmega8 but when it reads ax,ay,az values using adxl345_getdata(&ax, &ay, &az) function, ATmega hangs up and stop running. I am confused why it happens. please throw some lights on my doubts. i fegure out why ATmega8 was hanging in between while using sleep mode. now i am using ADXL345 in DATA_READY interrupt mode on int2 pin in active low by setting INT_INVERT high. i am getting continues interrupt from ADXL345. Am i doing wrong? use somethink like ADXL362, or MMA7660FC, with auto-wake up mode. Is it same as ADXL345 in operation WISE? i think you should get a look to the datasheet. hi davide,, i am having some basic questions. i am using a 5v supply to atmega board. is there some level shifters i should be using before connecting to the sda and scl of the adxl345. please help. whats is the value of vcc shown here ?? typical voltages used for sda and scl in adxl345 is +5V, my adxl345 works as in the schematics posted here. connect sda and scl as above. as supply for the adxl345 board i use +5v, but check that your chip is mounted on a board with a voltage regulator, or use a voltage regulator, because supply voltage range for adxl345 is 2.0 V to 3.6 V.
i have the same adxl345 breakout board as yours . it has a voltage regulator mounted on it. i found that the scl clock has been defined 10000 l in the program which should have been 100000 for 100khz clock. also i am working with a 16 mhz clock for ATMEGA 16,, SO I CHANGED the uart baud rate to 9600. can u think of any other changes i should be doing in the program to make it work with atmega16. thankyou for your help!! yes, for 16Mhz you can use 100khz for i2c. uart speed can be set to 9600 if you want. i have made sure i have connected things properly. but i am not getting anyting on hyperterminal. i have set debug enabled to 1.crccheck to 0.get atttitude to 0. i ve got a brand new accelerometer. so can u think of where i might get it wrong? start checking that your uart works, with simple uart_putc. then check if simple parameters are sent to terminal. more in general, do it at small steps. if you can, use a logic analyzer to check what's going on your i2c bus. at first use short cables (<30cm). use pullup resistor for scl and sda as suggested in the above picture.
. what could be the reason for this??? can u please help!! check that you have correctly initializated i2c. try with other i2c device. check with a logic analyzer. read i2c registers and debug with those reading. i also want one more clarification !! my breakout board has cs pin which i have left unconnected. in the datasheet for spi it says that it should be pulled high. also i have left sdo pin unconnected . i see from the video that i ve the same breakout board such as yours!! any suggestions?? with VCC, GND, SCL, SDA connected, it should works. for the angular displacement, isn't better to use a gyro? hy, thx for your code, programm ! -> whats the advantage of readin on serial event ? Thank for your feedback, i've nevere use the adxl330, my comment below is about this adxl345. Read using an event, instead of a loop, it's better cause the event it is catched when the uart has some char to read. The raw values read from the accellerometer, are conveted firmware side. Gravity is 1g, pressure on axis is (counts @ 1g - counts @ -1g) / sensitivity g, let's suppose for a 2g range a sensitivity of 8-bit (256 counts max, from -128 @ -2g, to 128 @ 2g), the value @ 1g should be 128/2, and -128/2 @ -1g, so (64 - -64) / 2 = 64. Given this value you can convert raw value to g force reading. Hello, in this blog you can find code for the compass, i've never tryid it but maybe the sht11 can be compatible whit the dht11, that code you can find here in that blog. Hi Davide, thanks for your work! I have a question about the calibration of the sensor. In your main.c there is a adxl345_calibrateoffset(); but is commented out in the program code. Your adxl345.c has a adxl345_writeoffset in it, but the funktion is never used. Where did i geht the offsetx, y, and x values to call the function? The adxl345_writeoffset it is used to write the offset to the offset adxl345 registers. I do not use this function because i compute the offset inside the microcontroller (see adxl345_getdata function: ADXL345_OFFSETX, ADXL345_OFFSETY, ADXL345_OFFSETZ). 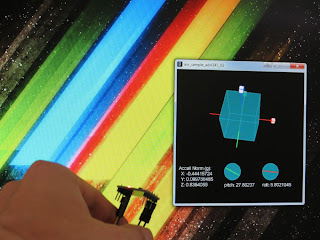 You can get the offset by calibration the accelerometer. You can use the calibration helper, or even you can not use my helper and run the calibration by hand. Hello. In this post you can find the code for ATmega compiled with avrgcc. You can build an Arduino library from that code, or you can use the Adafruit ADXL345 Arduino library. Please can you tell me whether we can map the X Y Z values from ADXL345 on an X-Y graph on processing ? Hello, I'm sorry but I do not understand what are you asking. The values from this X/Y/Z accel. are mapped to pitch and roll by the adxl345_getpitchroll function. Then pitch and roll are transmitted to the processing sketch. I have the exact component you use in your video and I want to program it for at ATMEGA324A-PU. 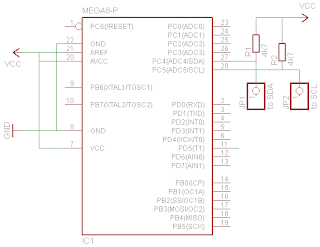 In order to use it in the I2C mode, is it necessary only to connect the SCL, SDA, 5V and GND pins? I read here https://fluxworkshop.com/products/bdaa100040-adxl345-3-axis-acceleration-module-10-pin that "The method is selected by driving the CS pin to 0V for SPI or 3.3V for I2C.". Shouldn't the CS pin be connected or does the module does this?